Some evacuation orders were lifted Thursday as fire crews steadily gained control of a 320-acre blaze burning in the Santa Cruz Mountains. Cool, moist weather conditions have assisted firefighters in their containment efforts, Cal Fire said. Heavy timber and steep inaccessible terrain remain the biggest challenges. Overnight temperatures were expected to dip to between 46-52 degrees, with a 30 percent chance of rain throughout the fire area. The Bear Fire, which started late Monday in the area of Bear Canyon Road and Deer Creek Road, is 35 percent contained, Cal Fire said late Thursday. Evacuation orders for the Las Cumbres community, Skyline Boulevard community and areas south of Bear Creek Road were lifted Thursday morning, according to officials. Those living along Bear Creek Canyon Road, Deer Creek Road, Rons Road, Dons Road and tributary streets are still under evacuation orders. Yelena Malysheva was one of the lucky evacuees who was able to return home Thursday after anxiously waiting to see if her home would be spared by the flames. "I haven't slept pretty much in the four days," she said. "I'm totally exhausted. My kids are at school. They're very tired, too." Though fire officials were generally upbeat about their progress in containing the blaze, there were some setbacks Wednesday. A drone grounded the much needed air attack for about an hour. As of Thursday evening, 905 fire personnel, 72 engines, nine helicopters and three dozers were still battling the blaze, according to Cal Fire. At least four unknown structures have been destroyed by the flames, according to Cal Fire, and 300 remain threatened as of Thursday morning. A Cal Fire official noted that the steep and rugged terrain has played a role in the injuries. Officials are still trying to determine what exactly caused the blaze to ignite. 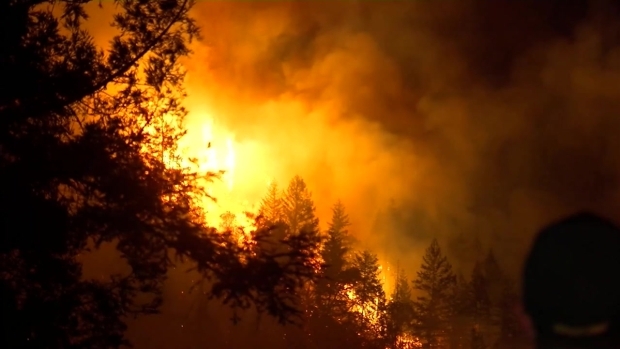 Towering flames could be seen ripping through dense vegetation and devouring trees right after the fire started before they were eventually suppressed by fire crews on the ground and in the air.